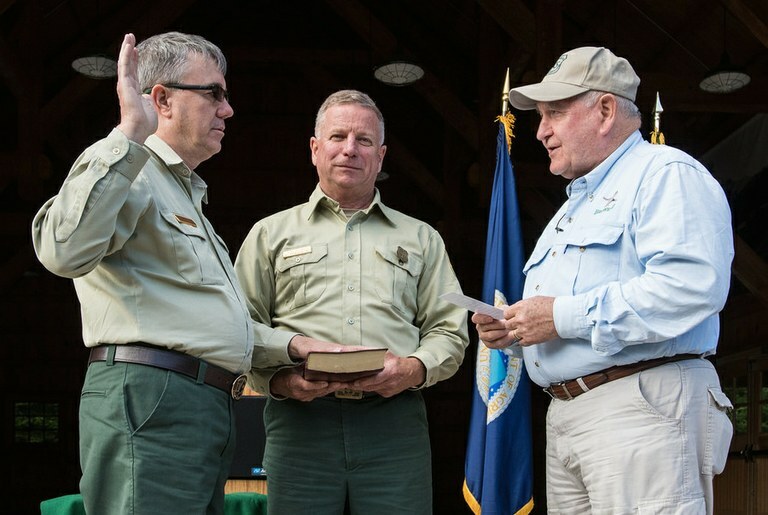 The new Forest Service chief, Tony Tooke, was sworn in by Secretary of Agriculture Sonny Perdue on Sept. 1. But he’d hardly settled into his new D.C. office when he flew to Oregon to see the damage caused by the Eagle Creek Fire, which is burning through the Columbia River Gorge. Tooke’s visit may indicate that the Alabama native will prioritize understanding the region’s forests and the problems they face. Tooke, who has worked for the U.S. Forest Service since he was 18, has held various positions based in the Southeast and Washington, D.C. and was most recently regional forester for the agency’s Southern Region. Typically, a Forest Service chief will have worked in the West at some point; the last three before Tooke all came from the agency’s regional office in Missoula. “If I were him, I’d be on airplanes nonstop,” visiting and learning about the forests of the West, says Char Miller, W.M. Keck professor of environmental analysis at Pomona College in California. With the West experiencing one of its most severe wildfire seasons ever, having a Forest Service chief who’s deeply familiar with the effects of insect infestations, fire suppression, climate change and drought is particularly critical. National forest lands on Tooke’s home turf in the Southeast are generally more heavily managed than those in the West; there’s a greater emphasis on timber production, and prescribed burns are more widely practiced there than anywhere else in the country. “It’s hard to tell how he will translate what he knows about that Eastern fire environment into the West,” says Don Falk, a professor in the School of Natural Resources at the University of Arizona. Department of Agriculture Secretary Sonny Perdue administers the oath of office to new Forest Service Chief Tony Tooke, with assistance from White Mountain National Forest Supervisor Tom Wagner, on Sept. 1. Tooke will have to confront the Forest Service’s long struggle with increasing firefighting costs, which now swallow up more than half the agency’s budget at the expense of other programs, including those meant to reduce fire risk. Though Congress recently passed legislation that included $1.6 billion for emergency funding to fight wildfires this year, the long-term problem remains unsolved. Getting on top of fire funding ought to be “job one” for Tooke, says Jim Furnish, a retired Forest Service deputy chief. He notes that it will be hard for the agency to succeed on other fronts if it continues to be forced to devote so much of its budget to firefighting. Tooke has acknowledged how dire the situation is: “We desperately need a fire funding fix,” he said during his visit to Oregon, adding that large wildfires are natural disasters and should be funded as such. 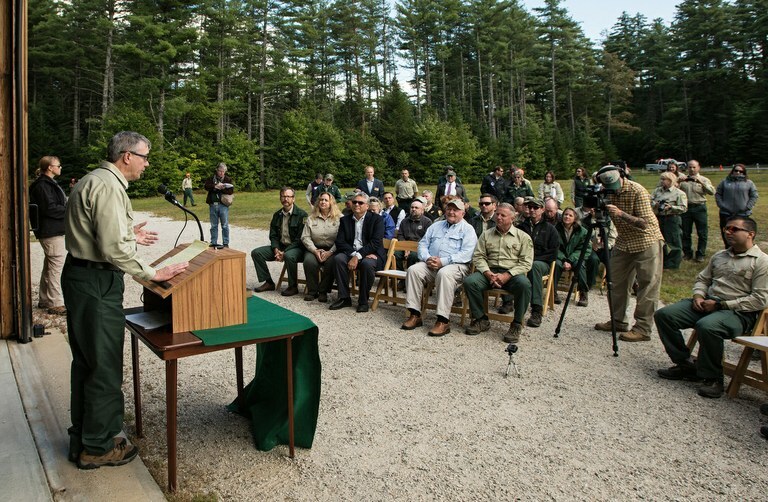 Tony Tooke addresses the audience after being sworn in as Forest Service chief. Current circumstances offer Tooke a “loud megaphone” to bring attention to the Forest Service’s wildfire challenges, Furnish points out. But he’ll have to use that megaphone carefully. Though the link between worsening wildfire seasons and climate change has been clearly established, the Forest Service now has to talk about climate change in coded ways. “It’s going to take a very nimble administrator to figure out how to keep responding to the pressures that climate change brings without saying that’s what it is,” Miller says. According to Susan Jane Brown of the Western Environmental Law Center, Tooke has a firm grasp of science and an understanding that climate change is making fire act differently than it has historically. While visiting the Eagle Creek Fire, however, he did not mention climate change in his remarks. Tooke’s background suggests he may be open to taking a progressive tack. In his role as Director for Ecosystem Management Coordination in the Forest Service’s D.C. office, he spearheaded the agency’s development of restoration guidelines for its 2012 land management planning rule. “The guidelines aren’t perfect,” says Falk, “but they show a thoughtful perspective on the national forest as an ecosystem and not just a pool of resources that can be extracted for profit.” Tooke is not, as Falk puts it, a “career timber beast.” “He has at least been willing to follow a career path through ecosystem management,” Falk says. He also has a reputation as a good collaborator, and Furnish, who has worked with him, described him as honest, sincere and professional.